It’s festival time! Sankranti, our most auspicious harvest festival is just around the corner – time for indulgence, good food, new clothes and lot of fanfare. Preparation for Sankranti, begins weeks in advance at my grandmother’s (ammamma) home and is always centered around fun and traditional festive foods. Sankranti evokes memories of the warmth and tantalizing aroma of food being cooked in ammamma’s kitchen that would perk up our palates and endless rounds of hot-piping sweets and savories would disappear as soon as they were cooked, much before lunch time..:). Boorelu, one of the most popular sweets prepared in the homes of Andhras, symbolic of joy and festivity, completely embodies the idea of a traditional Andhra sweet to the hilt. 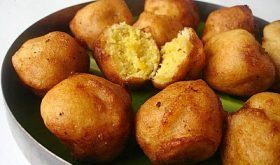 This perennial favorite is a deep-fried sweet ball, the filling of which is prepared from bengal gram, jaggery or sugar, coconut and cardamom powder being the flavor enhancer, which is dipped in a batter made from black gram dal and rice and deep-fried to a golden brown color. 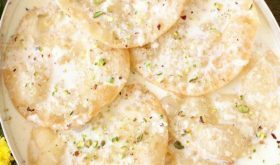 Hereâ€™s how to make these delicious treats with a golden hue and redolent with cardamom flavor to indulge yourself this festivel. Alternately, you can cook the jaggery or sugar till it melts and then add the mashed dal to the syrup and cook it till it forms a thick paste. Ensure that the rice-dal batter is thick so that it coats the balls evenly and holds shape. The batter should not be runny. Just before eating, make a small hole on top and fill it with a little ghee or melted butter. Its purely optional though. You can use the left over batter to make savory balls by adding a little more salt, cumin seeds and green chilli paste. Deep fry these savory balls till golden brown. Drain water from the black gram dal and rice and grind to fine paste adding very little water. It should be like a thick dosa batter. Add a pinch of salt and mix well. Leave aside covered. Cook bengal gram with just enough water to cover the dal. The dal should be just cooked and hold shape. Drain any left over water from the dal after its cooked. Add jaggery or sugar to the dal and use a masher to mash them together till it blends well. Take a heavy-bottomed vessel and add the ground dal paste and cook till it appears like a thick paste, stirring continuously as the dal tends to stick to the vessel. Turn off heat and cool. Add grated coconut, cardamom powder and mix well. Shape small bite sized balls like shown in the picture above. Heat enough oil in a wide heavy bottomed vessel for deep frying the balls. Dip each ball in the batter and let it coat evenly and place in the oil and deep fry till golden brown and crunchy. You can deep fry a batch of four to five balls depending on the size of the vessel. Serve warm. Store in an air tight container as they last for at least two days. Thanks for reminding me of Sankranti! I had no clue!Love this sweet,never made it before.I will make something for the family too.Thanks Sailu. First time here through google search on andhra food!! It’s so nice to meet an Andhra blogger like me..
And I promise this’s not my last visit!! Hi Sailu, booralu chaala bavunnayi..typical festival sweet, and the plate lined with banana leaf makes it look so nice and traditional! Delicious looking boorelu Sailu. The last time I made them, my purnam was too watery and I ended up with pakodi looking sweet. I would love to try them again for Sankranthi.. Thanks for the recipe. Boorelu are my all time favourites. Its been a while i made them. Gud to see you on my blog..thanks for your compliments. And you’ve got a great going here,indeed..I’ll definitely look for more and more works from you..It’s just like a feast for a food lover like me. Me,from Kakinada..and my maternal grand parents’re from vizag!! My best wishes to you and to your family.. Wish u and ur family a very very happy new year!! ur recipes are very good and like them all, to eat as well as to cook. I generally make boorelu for vinyayaka chavathi. Thanks for sharing them. me first time here..u have done a wonderful job..looks great.. They also go by the name ‘purnam boorelu’ in certain parts of Andhra. 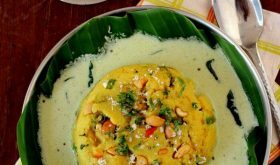 Should the batter be fermented over night just like dosa batter? No, Usha, you don’t need to ferment the batter. Boorelu is a new dish for me. However, the filling is similar to the holige or obbattu or pooran poli filling. I am planning to prepare this for Sankranti. Will keep you posted on how it turns out. Thanks for sharing your traditional recipes. Dear Sailu, I just wanted to add, my MIL makes the same, but instead of making fresh batter, she gets milled one cup udid dal with two or two and a half cups rice. This powder with just enough water she makes into a dosa-like batter (like the batter of besan for bhajjis) and leaves for about 15-20 mins before using, the boorelu tastes just as good – even traditional experts cant tell the difference. the rest of the powder is then used later to make ‘jantikalu’ (a kind of sev). this saves time (soaking and grinding), expecially when you meed to make them before you sit for puja, and before the kids get up! Hey Sailu, thanx for the recipe. I made poornam boorelu yesterday for varalakshmi vratam and they were a real hit!! Sorry, how long do the black gram dal and rice need to be soaked in water for? I tried making the boorelu this evening, it was just awesome.I used jaggery (1 1/2 cups instead of 1) . I sent them across to a telugu friend of mine and she gave me 100/100. So you get a 100 for this recipe. all ur recipes r too good and i like ur way of presentation a lot. really…very very interesting. whenever i made boorelu i found the outer part the topu one very hard. it is not soft. please help me.i dont belong to eastern part of a.p.i am from anantapur dist where we dont make this.i used rice and dal in 2:1 ratio only. please solve my problem. dear sailu,i loved the boorelu.they were so soft and wondreful.thank you.bye. Sailu garu, I am not able to get boorelu properly even though I followed your recipe. I used 1:2 ratio dhall and rice. I used sonamasuri rice. I could make nice poornam but the bater is not perfect i think. when i dipped poornam in the bater and put in hot oil it is breaking. can u give me some suggestion please? You are doing a fabulous job!!! Kudos to you and to the blog. It saved me so much time and I love the pics for every recipe. The output comes out similar too. Keep the good work going!! U do awesome work.. U r not just constrained to one type of food… ur everywhere… My 2 year daughter loves juicy sweets like jalebi/jangery/rasgulla etc… I am waiting for recipes from u on such sweets because I am 100% confident to try ur recipe… Please do post some when u get a chance..
Great site and great recipes. You are a saviour for novices like us. Please keep the good work going. Love the pics of poornam boorelu…my sister once suggested that we could make these boorelu in the ponganala gunta penam instead of deep frying it. We just have to dip the poornam in the batter and put into the gunta penam. I tried that once and it came out very well. You could try this too with equally great results. Dear Sailu, I absolutely love your blog…. you are so talented and inspiring. Thank you so much for sharing your yummmy world with us. With my sweet tooth, I am definitely going to try this one out. Hello Sailu gaaru… your cooking blog is very helpful for people like me looking for homely food here in US, thankyou !! your blog is very well organised and presentation is just great. 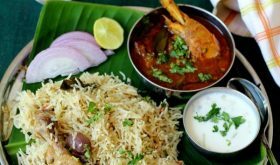 your blog has become a regular visit for me when ever i think of andhra cooking. thanks again for your wonderful efforts. Love,love, love your website! 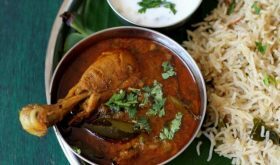 I frequently refer to your recipes for the typical andhra vantalu:)! Believe me when I say that my whole family enjoys your recipes! My mom makes these booris with pesalu (green gram dal) & leaves out the coconut usually in combination with mukkalu pulusu. Sigh! Thinking about it makes my mouth water! Anyways will try your version too & will try to post the ensuing results! Thank you sailu excellent presentation.i like boorelu. Very nice recipe..and very nice Blog .. I tried this recipe for the first time today and they came out excellent ! 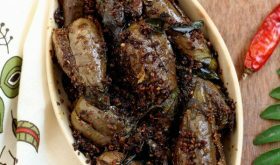 and also tried Guttivankaya with Poppy Seeds ..It was very nice..thanks for sharing..u really rocks ..Keep Going..
i tried the recipe, i think i did something wrong as my outershell was hard. i took 1 cup sona masoori to 1/2 cup whole urad dal. soaked it for 10 hrs grinded to a smooth paste, added salt & used it. What do u think might be wrong ? There was more rice ? You can reduce rice by 2-3 tbsps the next time you make it. The ration is usually 1:2 (1 cup urad dal and 2 cups rice). Rice can be slightly reduced. What can i do with the Leftover batter,i mean which is a coating,outer part?